As of January 1, 2007, the Bruderheim REA amalgamated with Battle River REA. Just as the Battle River REA is now, the Bruderheim REA was a member of the Alberta Federation of Rural Electrification Associations (AFREAs). 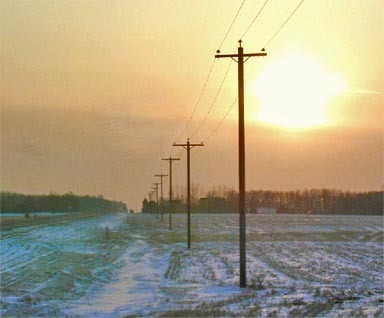 The benefits of membership in the AFREAs are calculated to be close to $100 per member service for rural electric services in Alberta for each of the past two years (2000 - 2001)  at an annual costs of $15 per year per member service. Those benefits apply to all rural electric services, whether they are owned by members of the AFREAs or not (to a considerable extent, the powerful voice of the AFREAs benefits even urban power consumers). However, if it were not for the public relations work, lobbying and interventions by the AFREAs, none of those benefits would be available to anyone; and that would come to pass if every power consumer in Alberta wanted to go along for a free ride. Freeloading does not pay. In the long run it will harm us all. You reached the website of the Bruderheim REA, a rural electrification association owned by owners of electricity services in the rural area surrounding the Town of Bruderheim, Alberta, Canada, roughly 14 miles NE of the City of Fort Saskatchewan. Effective January 1, 2007, the Bruderheim REA amalgamated with the Battle River REA. As the web pages of the Bruderheim REA attract a fair and increasing number of visitors each month, they are being maintained for historical purposes and to serve the interests of their user community. These web pages are not affiliated with Battle River REA and do not necessarily reflect the opinions of the Battle River REA or its Board of Directors. Cheap solar power! — Is this it, finally? Competitive- or Predatory Generating of Electric Energy? Competitive- or Predatory Marketing of Electric Energy? Still confused by your power bill? Deregulation in the U.K.: 12 years after the fact things are still in disarray, at least with respect to billing. Global Warming — If greenhouse gases are bad, how come CO2 increases agricultural productivity? Global Warming — Is the Earth warming up or not? Global Warming — Melting glaciers, shrinking polar ice and rising oceans? Global Warming — The Little Ice Age — Will there be another one? Global Warming — The solar constant isn't constant. The sun is a variable star. Global Warming — What is wrong with the forecasts? Why does it take so long to download or to send files? Pages for tips on energy savings are in the making. You are invited to make contributions.